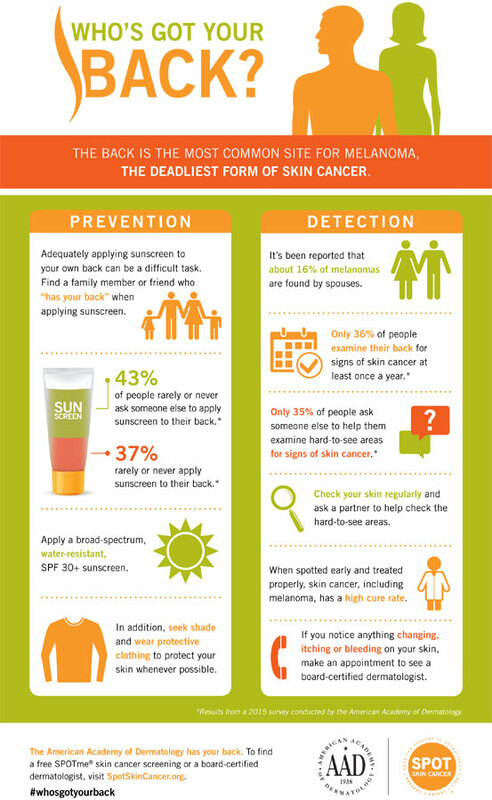 In recognition of Skin Cancer Awareness Month and Melanoma Monday, observed today, May 4, the American Academy of Dermatology (Academy) is asking the public, "Who's Got Your Back?" According to a the Dermatology 2015 Survey, the Academy found 37% of people rarely or never apply sunscreen to their back when it’s exposed to the sun. Share the Academy's campaign with skin care clients to spread awareness of the importance of applying sunscreen and examining skin for suspicious-looking spots.